March 25, 1924 – January 8, 2018. It is with great sadness that we share the passing of our beloved husband and dad Wendel Huber. Wendel was born in Aargau, Switzerland March 25, 1924, he was a veteran of the Swiss Calvary during WW2. As a young man he travelled to Canada to answer an advertisement for a agriculture opportunity in Cherry Creek where he worked for several years. From there he pursued logging in Port Alberni eventually moving back to the Interior where he and his brother Alfred bought the old Fadear Creek Ranch in Upper Louis Creek valley. This was where he met and married the love of his life, Joy Tudor, and they started their family. Wendel is survived by his loving wife of 56 years, Joy, sister Marie Stocker of Switzerland, and five children: Ross Huber (Janet), Leo Huber (Dawn), Rita Mosdell (Steve), Heidi Schilling (Pat), Christy Allen (George). He is also survived by his 12 grandchildren. 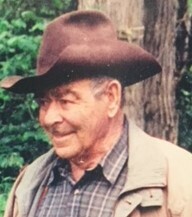 Wendel’s love of ranching brought them to the Home farm in Squam Bay in 1969 which is still within the family today. For the next 50 years Wendel enjoyed happiness with his family and friends. So sorry to hear about your Husband, Father, and grandfather. He was always a kind, soft spoken man, always had a good story to tell you. All our thoughts and prayers are with you. Dear Joy and family.. so sorry to hear of your loss. Will never forget the time I spent with your family when I was a very young girl and what a kind gentle man Wendel was. Your cherished memories and the strength of family will help you through this difficult time. Time is a great healer….thinking of you. Wendel had a kind heart and warm soul. We remember well the days haying on the ranch as teenagers. He was a good friend to our family and will not be forgotten. I Truly Believe that if You were Fortunate Enough to stand in front of Wendel Huber You Stood in the Precence of Greatness A Saint and a Man Who along With His Beautiful Wife Joy not only cared understood and helped the unfortunate abandoned and unwanted But Thru Their Love Gave Me a Belief That no matter What Someone Cares And Thruough their Children This Philosphy Lives On ! !Thank You Wendel !! Gee Iam Gonna Miss You!! !